Walnut Shells  - $4.00 : Yarn Tree, Your wholesale source for cross stitch supplies. Item 4415. Walnut Shells. 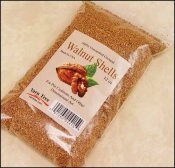 Finely ground walnut shells. Perfect for smalls, stand-ups, pincushions, or other dimensional art. 12 ounce package (approx 2 cups).